ABBA TRAVEL & PILGRIMAGES SERVICES INC.
ASIALIGHT TRAVEL AND TOURS, INC.
ATJ TRAVEL & TOURS INC.
CEBU HOLIDAY TOURS & TRAVEL, INC. FAITHFUL TOURS AND TRAVEL CO.
FUNTASTIC TRAVEL & TOURS, INC. GLOBAL FRIENDS TRAVEL AND TOURS PTY. 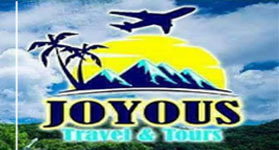 I TRAVEL, I EXPLORE TOURS & SERVICES CO.
MARIST ROYAL HOLIDAYS TRAVEL & INDUSTRIAL CORP.
PELAGOS TOURS & TRAVEL CORP.
RAINBOW TOURS AND TRAVEL, INC.
SOUTHWIND TRAVEL AND TOURS INC.
TAGBILARAN LAND SEA AIR TOURS AND TRAVEL INC.
YOOHAN TRAVEL & TOURS CORP.